Digital models should reflect the reality of the city, not only the urban form but also environmental conditions – such as the weather. Digitalurban has mounted a wireless weather station on our roof, it provides a myriad of data and is updated every two seconds. 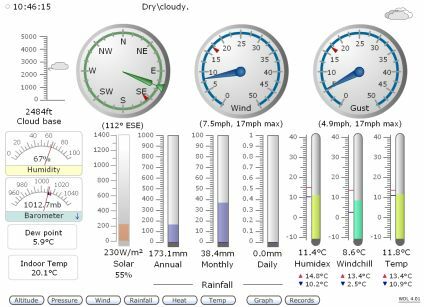 It is then possible to embed this data in a web page, using Flash and a product entitled Weather Display Live. This allows live data to be viewed via the web, with the dials tweening according to local conditions. If this data – or an overview of – such as Sunny, Rain, Partly Cloudy etc could be linked to a 3D model, it would enable it to accurately reflect local conditions. If a number of weather stations are linked up, they could be used to visualise the urban heat island effect, live and in 3D. Combined with symbols and locations for rain fall etc this would provide a live temperature gradient and other weather data in a unique visualisation. Well that’s the plan, for now you can view the Flash based version, live from our roof. It’s probably also the best way to create the kind of ‘mash up’ that it seems you’d like to do since it seperates the data layer from the presentation layer. You could create a DTD and let others get started! Sorry about the error, its up and running now. http://www.casa.ucl.ac.uk/weather/clientraw1.txt this updates every 3 seconds. Everything now works in Safari for 10.4.7 except the “Records” button (which gives an error). Very cool!